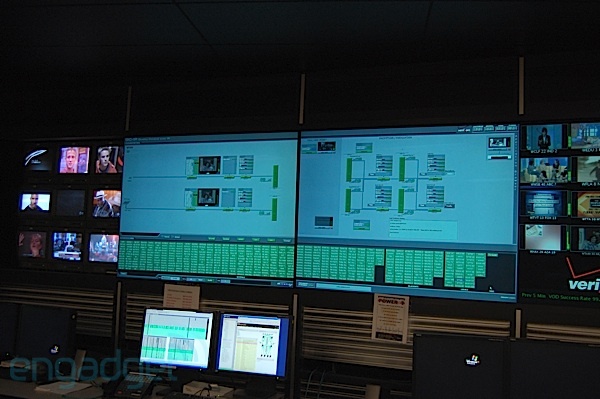 When we took a tour of one of the only two Verizon FiOS Super Head Ends (SHE) in the country It didn't surprise us to learn how much different Verizon's FiOS infrastructure is from most mutli-channel video programming distributors (MVPD) out there. After all FiOS was the first national fiber to the home video provider. But what did surprise us was how similar some things are. This isn't shocking to FiOS customers who just like many Comcast and TWC customers use a Motorola set-top, or to the TiVo and Media Center users who use FiOS with a CableCARD. Verizon entered into the MVPD business less than five years ago, which means it was able to choose to improve the design where it made sense, while sticking to what works instead of reinventing the wheel. 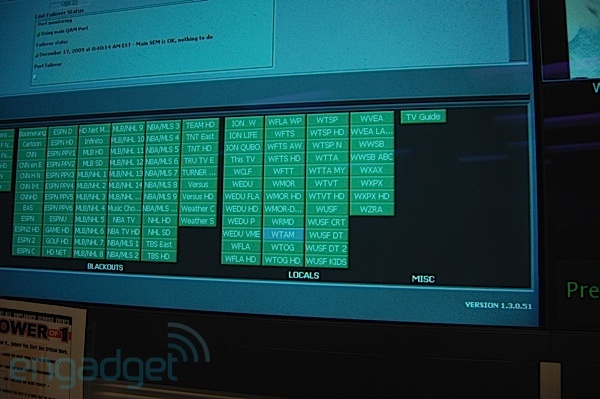 And although not everyone can show up at a Super Headend and get a tour, everyone can click through and see a few pictures and learn a little bit about how your favorite show gets to your HDTV. Hidden away in a nondescript office park in Temple Terrace FL, is one of two Verizon Super Headends (the other is in Bloomington IL). From the outside one would never suspect that millions of customers would be watching TV from the equipment that is inside. But this is where all of the programming is aggregated before it is sent via fiber throughout the country. The content creators obviously don't create special feeds just for a single MVPD, so just like everyone else, Verizon grabs the encrypted signal with a farm of satellite dishes. But what is different is that Verizon has only two farms for FiOS throughout the entire country. This is to provide redundancy, and that theme continues on to just about every piece of equipment as well (so yeah, there are like four of everything). 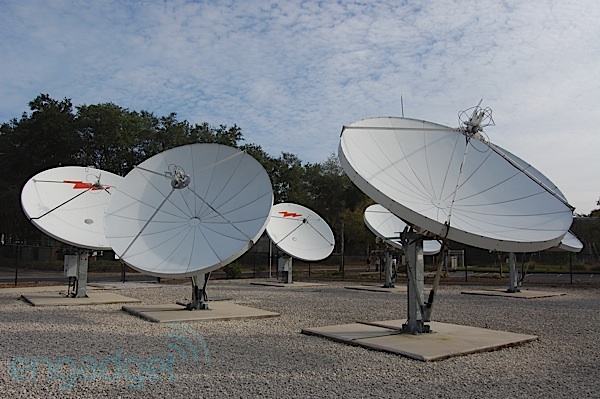 It takes just 13 satellite dishes to pick up the almost 600 channels distributed from here, but there are also 7 backup dishes as well as three more ready to go in case the first backup fails. These can each be aimed at another satellite, but for the most part the dishes are never moved. 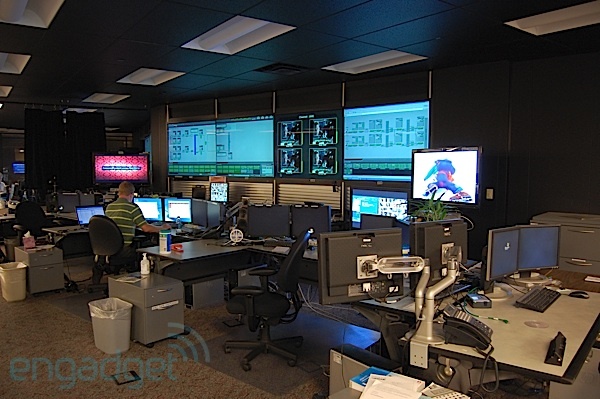 These signals feed the actual Super Headend where they are aggregated and then passed on to the nationwide Verizon fiber network and distributed to the 15 regional Video Hub Offices (VHO). 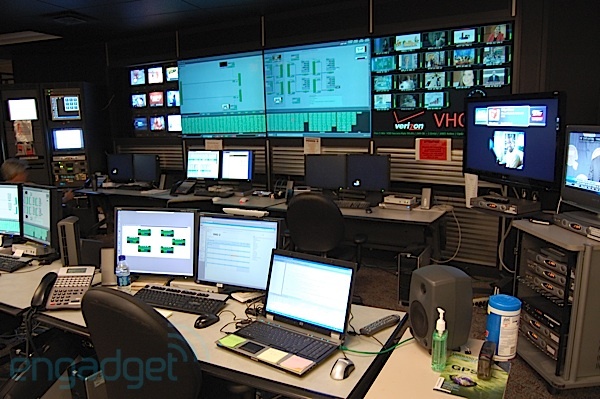 Each of these Video Hubs grabs the channels for their region, and prepares the signal to be passed down to the customer's home. For the most part, all the national channels are collected at the SHE, but there are some exceptions like a local channel that is distributed via satellite instead of via fiber or over-the-air. What really makes FiOS unique is that while other MVPDs will have farms throughout a service area, by using fiber, Verizon is able to reduce the required number of facilities and at the same time improve availability. We have a feeling that if Comcast or TWC was starting all over, they'd follow a similar architecture, but who knows if it'd actually make sense for either to make the change now. 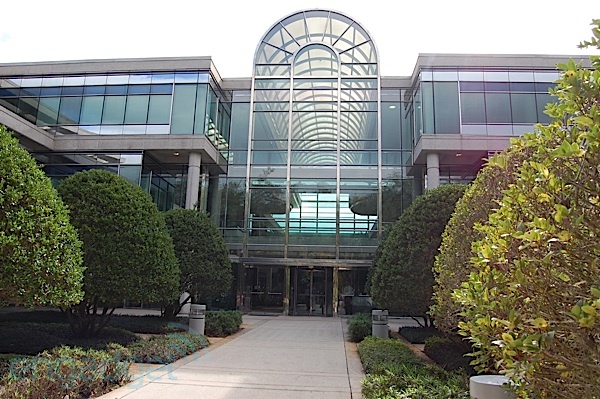 In the case of the Tampa Bay area, Verizon built the regional Video Hub in the same facility as the SHE, but this is the exception. Each VHO is connected to the same nationwide fiber network, but only grabs the channels that are available in that area. So in Tampa that is about 450 of the 600 channels. The VHO also aggregates local programming from your NBC affiliates (for example) or a regional sports network that isn't distributed via satellite. Since the VHOs don't have an satellite dish farm, they get these local channels via a fiber connection connected to the broadcasters, but also have antennas on the roof for redundancy -- just like the SHE, everything is redundant here too. But the VHO has more to do than just inserting local programming and sending it out to your house. For starters, local advertisers can have their commercial broadcast on ESPN HD, and the VHO is where that happens. The advertisers send them a DVD, VHS or whatever they've got, and the team at the VHO gets it on to their DVR and schedules it to run at the right time and on the right channel. This is also where the loud commercials can come in, and we were told of how difficult it is to get this right, and we feel for these guys and hope that an automated solution can be found, but it was nice for us to hear that it isn't a simple case of an over zealous advertisers trying to grab our attention. The other interesting thing is that regional blackouts are enforced at the VHO. So whenever ESPN HD blacks out a game and shows ESPNNews instead, the equipment that makes that happen is here. What struck us as odd though is that it isn't controlled by Verizon. Now obviously the call of what to blackout is all based on contracts and a complete mess, but while the equipment that controls the blackout is at the VHO, it is actually remote controlled by the network. So in other words, if the game you want to watch isn't available in your area, calling Verizon isn't going to do you any good. From the VHO the channels are all modulated on a QAM channel which is delivered via fiber to your home over an RF Overlay. This means that the ONT outside your house grabs the signal off the fiber and turns it into a pure RF signal so it could be distributed throughout your house on your existing coax cable. This is key because otherwise installing FiOS would mean running wires all over your house which obviously isn't an option for most. The RF overlay equipment can exist in the VHO itself, but has a range of about 70 miles, and since a VHO serves a much wider area, the signal is usually distributed to a Verizon CO near your house first, before it is converted to RF and overlayed on the fiber that is running to your house. The other thing that happens at the VHO is video on demand. The VOD servers are also in the VHO datacenter, so they are also monitored and it is even possible for Verizon to deliver different VOD offerings to different regions. One thing we are still waiting to hear on is where the CCI flags get set. The VHO manager said he'd have to look into it, but it makes sense that he wouldn't know since no FiOS regions seem to be setting the CCI flags. We don't say this very often, but Verizon FiOS really is different, in that their customers love their service. We often write posts about other providers that lead to lots of hateful comments, but whenever we write about FiOS, the most negative thing is that it isn't available everywhere. We also think that by even offering tours like this it goes to show how hard Verizon is trying at this video service thing. Don't get us wrong, FiOS doesn't do everything perfectly, but we'd be willing to bet their new customer retention stats are in a league of their own. So thanks to Verizon and all those who made this tour happen.